The seeds of culture and human creative energy lie in deep memory. In the long expanse of time over which humans evolved from early hominids to homo sapiens there is the common denominator of insecurity. Not only was there the threat of predators but there was also the threat of scarcity. Life was short, fragile and for the most part brutish (thanks Hobbes). Human consciousness developed in response to this relentless pressure. Security came from the collective and meaning was drawn from a sense of embeddedness in the group and the world that might be called unconscious relationship. Over time culture grew as the brain grew and human experience was reflected in our increasingly large brains and articulated in language (Wade, 2007). But then things changed as we developed agriculture and the sense of separation that comes with the ability to manipulate one’s surroundings (Christian, 2004). As humans developed ever more complex social structures and all that these entail they became ever more distant from the world. Spirituality became a way back to this sense of belonging in relationship. The agricultural social world was still insecure – now there were other human beings as predators and agriculture was always vulnerable to the shifting moods of climate – so culture emerged as a way to build security and meaning into the unstable. It also gave expression to the human desire for connection that I am characterizing as ‘relationship’ – yet because humans build patterns they also create institutions to maintain them and with these came organized religion. The result of all this is that forms came to dominate lives and to ingest our dreams and to edit and delete the possibilities immanent in the formless world of inner being. Humanity was in a reductive trap in which form and formless danced ever more closely as the binary that was the hallmark of being. Dualism and the dialectic of form-formless thus took over in the great Schism at the heart of human pain. 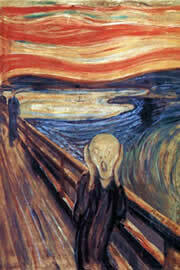 The rise of industrial civilisation has amplified this schism until we all look into the eyes of Edvard Munch’s screaming woman and find something of our selves there – a portrait of our inner alienation – not unlike Dorian Grey’s betrayal in paint. This amplification is what sustainability activist Sara Parkin calls the compound interest version of history (2010) in which the long journey from relationship to separation has gained momentum and intensity not arithmetically but geometrically. Ironically as we have striven for security we have created insecurity all around us. Now the self, defined and bound by addiction to doing and numbed through habit stands on the brink of yet another evolutionary possibility. This alienated self we call an individual – naked in the light of the world, standing alone, above, shriven of all sense of relationship, free to act, born to consume yet desperately lonely. And here we stand with destiny at hand, knocking on the door like Beethoven’s baleful theme from his Fifth Symphony and we do not know what to do. We are paralysed in our own power. And that is the real paradox. Yet, the spirit is still there framed in this moment as a reminder of the relationship we have lost with the planet and our fellow travelers. It is the counterpoint to fear and insecurity. It is what Prabhat Rainjan Sarkar calls the ‘longing for the Great’ (1982) – that sense of connection again that lifts us from paralysis into power. And ironically this is done by dropping our addiction to individualism. This for me is what lies at the heart of Neohumanist spirituality. It is a reframing of humanity, not as above the common confusion of being, but as co-creators with all of life and its material base. This is a shift in consciousness like that which heralded the emergence of humanity from the savannahs of Africa on two legs, with language and tools; it appeared again with the domestication of crops and animals at the beginning of the agricultural age and yet again at the moment we significantly increased our ability to manipulate the natural world through ever more sophisticated technology in the industrial age. Yet, such is the law of compound interest history that each period has been significantly shorter (and more intense) than that which proceeded it. With each step along this evolutionary road we have further lost our ability to relate. Spirituality is about this ability that lies beyond form. And Neohumanist critical spirituality offers yet another step forward in this human evolutionary tale. As the environment and human social and technological complexity reach breaking point we reach yet another evolutionary cross road. To evolve now, it seems to me, requires us to find again the power to relate, but not instinctively as our early ancestors did. For we now have the possibility of becoming conscious beings aware of our place within the whole and of the responsibility and potentiality of this new way of understanding our place in the Cosmos. This is a form of critical consciousness and the sense of relationship is spiritual as it is embodied, as opposed to religious which is the product of institutional forms. This emergent consciousness promises to underwrite an entirely new identity and socio-aesthetic expression, perhaps even a critical renaissance which grows out of what Peter Wexler calls a ‘wild history’ and leads to a ‘mystical society’ (Wexler, 2000). At last the macro-historical wave that took us from unconscious relationship to hyper-individualism must retreat before a return to a conscious sense of relationship, an awakened relating, that offers us a vision of a new human being in vibrant relationship with the entirety of existence. This progression is captured in Figure 1 as a fluctuation superimposed over a set of waves. It is a raw macrohistorical representation of the journey of humanity from embedded relationship that is essentially passive and unconscious througincreased alienation and self destructive behaviour to an awakened sense of relationship. Each wave heralds the emergence of a different kind of human being – the first is the hunter gatherer, the second is the agriculturalist, the third is the industrial and the forth is what? A new human being in a relational universe that is waking up to itself through our own eyes, as physicist Michio Kaku speculates (2005). This longing for the great is calling for a neohumanity that is defined not by any external advantage but by an inner orientation to life based on consciousness of relationship. This consciousness lies at the heart of a critical spirituality as it establishes the basis for all activity based on an ethics of relationship. Such a relational ethics will call forth a new form of civilisation over time. But it will take significantly less time than the past as each calling forth has been telescoped due to the law of increasing returns. Thus Type 1 civilisation is agrarian in nature and humanity is more or less collective in that there is no individual at the heart but the pattern of the tribe. This form offers us a proto individualism as it tends towards hierarchical structure and alpha leadership models as found in the classic civilisations. 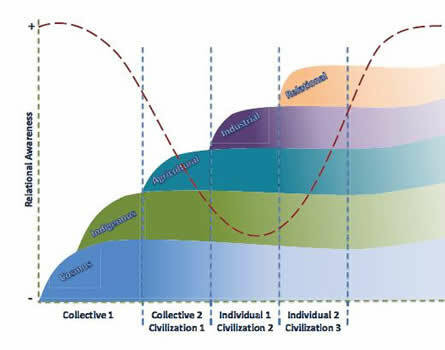 Type 2 civilisation is industrial and defined by the individual as the primary source of creative and social energy. In this formulation the collective is shunned (remember Margaret Thatcher’s neoliberal dictum that there is no such thing a society, only individuals) and individuals stand outside of relationship (Christian, 2008). Civilisation Type 3 will see, if we read the signs correctly, a return to relationship that is qualitatively different as it is awakened to its own embeddedness in the world of being and things. I believe this awakening heralds a new revolution in critical consciousness, a Critical Renaissance, that will give a new form to human cultural expression and reshape human identity, the values and aesthetic principles upon which order is founded and meaning generated. It seems likely that the Neohumanist awakened consciousness that P. R. Sarkar articulated, which involves the acknowledgment of relationship and an ethical connection with the universe, is to be the next step in human evolution. Christian, D. (2008). This Fleeting World: A Short History of Humanity. Great Barrington, Massachusetts: Berkshire Publishing Group. Kaku, M. (2005). Parallel Worlds: The Science of Alternative Universes and Our Future in the Cosmos. London: Allen Lane. Parkin, S. (2010). The Positive Deviant: Sustainability Leadership in a Perverse World. London: Earthscan. Wade, N. (2007). Before the Dawn: Recovering the Lost History of Our Ancestors. London: Penguin. Dr Marcus Bussey is Research Fellow in regional Futures at the Sustainability Research Centre, University of the Sunshine Coast in Queensland, Australia.